The merry month of May has passed quickly, and was a mixed bag weather-wise ending with record heat. Some of us have been blessed with rain when needed, and others are already struggling with drought conditions. I am so grateful that the potager is thriving. In fact, so far this has been the most productive season ever! Pounds of spinach, lettuces, radishes, bok choy and green onions have already been harvested. The first strawberries have been devoured, beets are swelling, and the peas are setting on. The first tomato and beans bloomed last week, so it won’t be long until we’ll be harvesting them as well. May was lovely, and hopefully June will be as well. Minnetrista Garden Fair: Sat., June 2, 8-4 This annual event is attended by nearly 5,000 gardeners. Large tents house a variety of vendors selling plants, garden décor, pottery, and more. Several horticultural groups also have displays. Be sure to visit the outstanding gardens surrounding the cultural center, the Orchard Gift Shop, and the adjoining Farmers’ Market. Note that this year, it is a one-day event only. Herb Society District Gathering: Friday, Aug. 24- Saturday, Aug. 25. Plans are underway for a really special herb gathering in Indianapolis. Mark your calendar and plan to attend. There will be fantastic gardens to visit, terrific speakers, herbal treats and continental breakfast provided by the local herb group, silent auction, door prizes, and lots of herbal information and networking, plus a couple of make-it/take-it crafts. So, plan to come celebrate “Red, White and Blooms!” You do not have to be a HSA member to attend. More details in upcoming newsletters, but mark your calendar now. Whirlybirds & Walking Sticks One of the things I love about gardening, in addition to the beauty, the flowers, the bird songs that surround me and the ever-changing sky overhead is the opportunity to look at Nature up close. Recently two things caught my attention. Who hasn’t grown up watching the “whirlybirds” or “helicopters” twirl downward from the maple trees in spring? The paired seeds, wrapped in thins sheaths of papery beige have delighted children of all ages as they fall in lazy circles and form drifts below. A single maple tree can produce hundreds of thousands of seeds. I’ve observed that when something produces what seems to be a huge overabundance of seeds, it’s because Mother Nature knows most of them will not survive. Sometimes it’s because of harsh conditions of weather or soil, but that’s not usually the case for maples that generally grow in productive areas. So, the other obvious answer is that Mother Nature expects most of the seeds to be eaten, and that caused me to wonder who eats maple seeds. My first guess was chipmunks, because we seem to have an abundance of those little critters this year at the farm, and at our home. They are fat and sassy, and often in the areas near the maples. The small reddish-brown squirrels that we grew up calling “piney squirrels” are only slightly larger than chipmunks, with bushier tales and I’ve seen lots of them in the area, too. So, as I weed and plant I’ve been watching, and both chipmunks and piney squirrels do eat maple seeds. A little research says that some birds also eat them, but I haven’t observed that yet. I have observed that some maples seeds have tiny holes drilled into them, most likely by some insect. I haven’t had time to research what those might be. I’ve even heard that people collect and eat maple seeds, cooking them like peas, or roasting them like pumpkin seeds. That’s something I may have to try. One has to be very observant to see this tiny, tiny walking stick whois almost identical in color to most leaves. I’ve always thought Walking Sticks were fascinating. Apparently they are members of a very large family containing 3,000 species. All “stick insects” are plant eaters, mainly leaves. The largest types can reach 22” long and have been known to decimate entire forests! Fortunately, the ones in our area are much smaller and do little damage. 1) Plant sweet alyssum close to seating areas now to enjoy its fragrance, and let it self-seed, so you can enjoy it again later. It is also a great companion plant for everbearing strawberries, helping to attract pollinators. 2) Keep pansies deadheaded to prolong bloom, and remember they are heavy feeders, so fertilize when you water. Move containers of pansies into partial afternoon shade when the days get hot. 3) Dead head daffodils and other spring bulbs, but allow the foliage to ripen and turn brown before you remove it. Fertilize finished bulbs, so they have lots of nourishment to produce bigger bulbs and flowers next spring. Mark clumps that will need to be divided the end of August. 5) Feed emerging lilies with a bloom booster fertilizer (big middle number). 6) Prune spring flowering shrubs and lilacsimmediately after they bloom. Pruning later will eliminate next spring’s flowers! 8) Plant some containers with annuals in your favorite colors to pop into the garden areas close to patios and decks, if nothing is blooming there. You can move them around as needed, or collect them into a grouping for parties. 9) Scissor mums and asters every three weeks, so they will get really bushy and sturdy. I usually clip off an inch or two each time. Stop trimming July 4th. You can also trim sedums, phlox, or monarda to promote more blooms, stagger bloom times, and keep them from sprawling. 11) Keep an eye on hollyhocks for those nasty little worms that skeletonize their leaves. Spray with insecticidal soap, being sure to get the undersides of the leaves where the insect eggs will be hatching. 12) Those little beetles that make the brown spots on mint leaves are already here….trim off those leaves and spray the plant with insecticidal soap. The mint will quickly grow fresh new leaves. 13) Watch carefully for cabbage loopers on brassicas. At first sign, hand pick or spray with organic Bt, a naturally occurring bacteria that will kill hatching worms as soon as they begin feeding. Spray after each rain, getting undersides of leaves, too. 14) Broccoli, cauliflower and garlic would appreciate a side dressing of fertilizer NOW, and be sure to keep them watered if you are not getting rain. 15) Keep the hummingbird feeder cleaned and filled…they’re feeding heavily as they raise new families. 16) Enjoy the Dames Rocket, Columbines, May Queen Shastas, Lungworts, Forget-Me-Nots, Hellebores, Bleeding Hearts, and all the other bloomers that are filling the garden with color after the bulbs. 17) Harvest those beautiful chive blooms and pop them into salads, or the recipe below! Or, steep the blooms in white vinegar for two weeks. They will turn the vinegar a lovely shade of pink, and add a wonderful light onion flavor to salad dressings, marinades, and stir-fry. There are some herbs that are better known as weeds, such as the common wayside plants known as dock. There are several kinds of dock, but the one I like best is Yellow Dock, also known as Curly Dock (Rumexcrispus. )You may recognize the Rumexpart as familiar if you’ve ever encountered the culinary herb, Sorrel or the diminutive Sheep Sorrel, which are related. 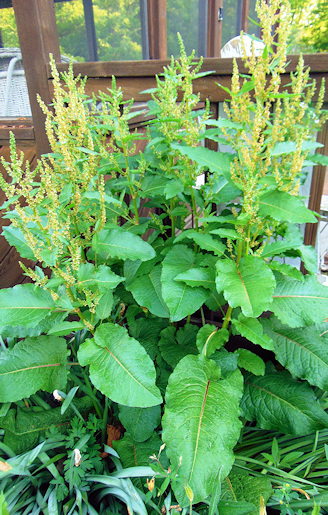 Yellow Dock is a perennial with very large lance-shaped base leaves early in the season. As spring progresses, stalks grow 3’ tall with increasingly smaller leaves as it rises. By late May or early June the stalks are covered with green, very small “flowers.” These ripen to rusty-brown seeds in June-September. The plant gets its name from the yellow root, which herbalists have used for centuries. The root has been dried for a “blood purifier” tea that was also used for chronic skin diseases, rheumatism, liver ailments and sore throats. The tea can cause or relieve diarrhea, depending upon the amount consumed, the stage and time it was harvested, and cultural conditions. Therefore, it should be used with caution by experienced practitioners. Yellow Dock is allowed in my garden because I love the glossy, large leaves and the height it provides. However, I do not allow the seeds to ripen or drop. I clip them off before they turn brown, although the plants along the woods are allowed to produce ripe seeds for the chickadees and other birds that love them. Next month, we’ll talk about Yellow Dock’s cousin, Burdock! 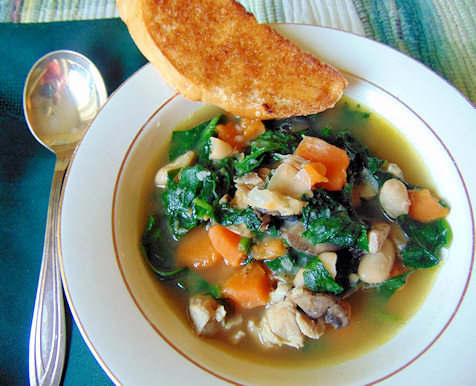 Spinach Soup This recipe first appeared in my 2nd book, Herbal Choices. We’re inundated with spinach this time of year, so it appears on our table often. So quick, so easy! Heat 1 T. oil in large kettle on high heat. Dice 3 boneless, skinless chicken breasts into 1” cubes. Add to hot oil with freshly ground pepper. Stir; cooking quickly to sear meat. When lightly browned, add a 14.5 oz. can chicken broth and 3 bay leaves. Reduce heat to medium. Tear fresh spinach until there are 3 c. torn spinach (or a 13.5 oz. can cut spinach). Add spinach to kettle. Stir.Cook another 5 min, until sweet potatoes are just tender. Taste for seasonings. Top each serving with pecorino or parmesan cheese shavings, if desired. 8 servings. Just in under the wire for the hectic month of May, but I promise to be more timely in June. I hope your gardens thrive, and that you have some special moments to notice the beauty of the world and nature around you.